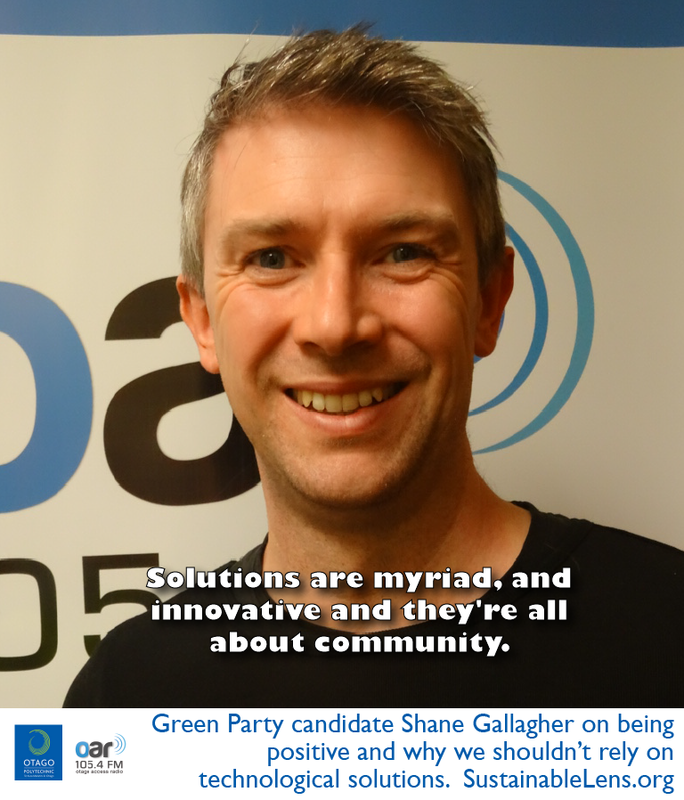 Regular co-host Shane Gallagher is standing for election in Dunedin South. Accordingly, to comply with the Electoral Act, he is unable to appear on the show as host until after the regulated period. In this show he appears as a guest. Shane Gallagher is a Green Party candidate for Dunedin South and a trade unionist. He works at the University of Otago and formerly owned AliMcD Agency. He was born in England to Irish parents, grew up in Dublin and went to university in Dublin and Edinburgh where he studied Linguistics and English. Science informs our understanding of complex systems but it doesn’t fully explain it. That technology can fix everything is the Prometheus myth – that technology is going to come along and solve all the problems that we have. But it’s not, it can’t – the problems we have are systemic, they’re massive, they’re to do with our behaviour, they’re to do with our relationships and to do with the quality of our exchanges in this world. The system we have developed is driving us in a direction that is destructive, and it’s destroying the planet. Technology is not going to fix that problem because the problems aren’t really are of technology. We have solutions already, we can move extremely quickly to total renewable energy, we could go green very quickly, the technology is there or in its infancy but if threw the weight of our amazing intellects, innovation and incredible problem solving at them we could probably solve the last problems we have fairly easily. But the problem isn’t the technology but the systems that we have created: the corporatisation of the world, the drive to constantly grow – we can’t grow infinitely. We have an elite that don’t want to say “hey, the party’s over, we’re living in the age of consequences”. Solutions are myriad, and innovative and they’re all about community. We need to shift away from a consumerist model of people being isolated in their homes…communities fragmenting, to rebuild community, to rebuild caring and empathy – empathy and compassion are really at the heart of what this is about. When we look after the earth we look after each other and we look after ourselves. We do all three things simultaneously – it’s about love. People are starting to understand that they are part of this world. That if they want a good life for themselves and their families their children and grandchildren and great-grandchildren then they have to be a part of the solution, not part of the problem. Business is getting on board. The old extractive industries making as much money as they can with no care for society or the environment or their workers – they’re there simply to make profit – they’re being superceded by a new generation of business people who actually understand that they’re part of society, they’re part of the world and they need to make an active contribution. Activist: Yes. I knew I needed to change the world in some way. Challenges: Bring the message of sustainability out there – firming up what it means for people, and how its different from what is happening now. Advice: Get out and communicate with people.